We are all looking for ways to save time during the holidays. If you like to make chocolate- dipped treats, here is a great hack for melting your chocolate. 1) Put chocolate chips in mason jars. Place the jars inside your slow cooker. 2) Add hot water to your slow cooker until the water is about halfway up the sides of the jars. (Be careful not to get any water inside the jars). 3) Turn the slow cooker to high, but do not cover the jars. 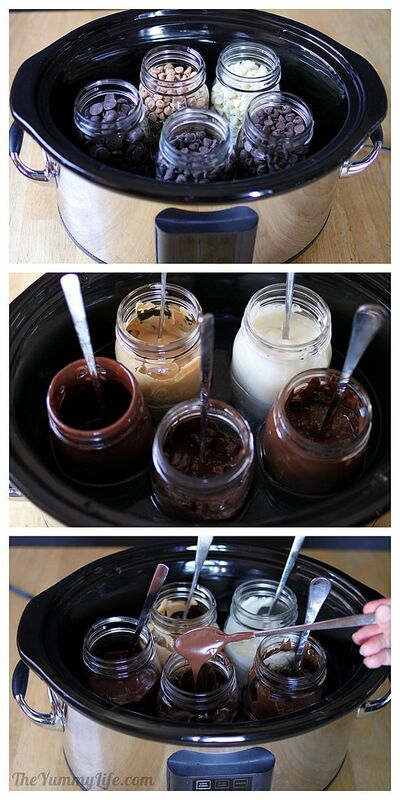 4) After about 30 minutes, get a long handled spoon and stir the chocolate inside the jars. 5) At this point, the chocolate should be the perfect consistency for dipping or drizzling. It will stay this consistency for about 2-3 hours. Easy, right?! You can experiment with different kinds of baking chips…dark chocolate, white chocolate, peanut butter, mint, butterscotch, etc. Be creative and have fun!